One thing that I have been consistently good at for the past few weeks is entering races and then not actually running them. 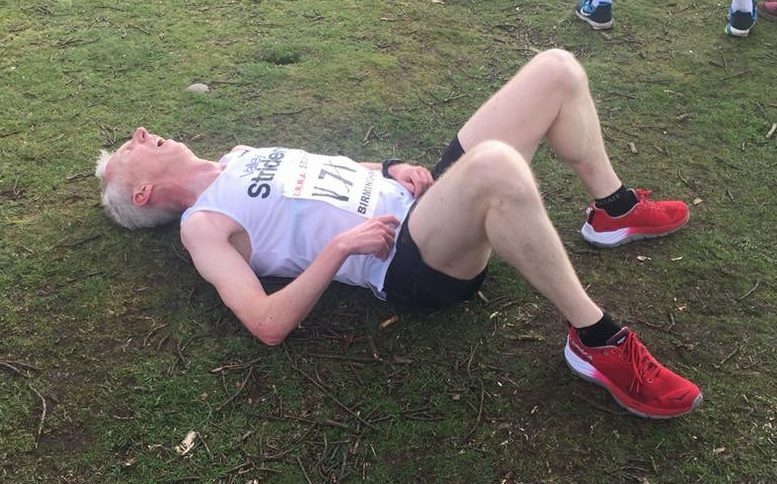 My streak started with the Chevin Chase on Boxing Day which I swerved because of a sore achilles and the desire to save myself for an all-out effort at the Ribble Valley 10K the following day. Floods then caused the Ribble Valley race to be cancelled. I had also entered the Dewsbury 10k in two weeks’ time, but earlier this week I accepted an invitation to spend the same weekend down South to celebrate my mate Tim’s 50th birthday, so I’ll miss that race too. Today, I was due to run the Inskip half marathon over in Lancashire. A sharp snowfall last night and icy roads ice caused it to be cancelled early this morning. Ironically, I chose to enter Inskip as an alternative to the ever popular Brass Monkey half marathon in York, also held today. The Brass Monkey went ahead without a problem and on perusing the results I see that many of my mates ran impressive times. I’ve not even run a parkrun in anger for over a month, I feel that I don’t even know if I am fit or not anymore. I’m chomping at the bit. My week of not running at all was also a spectacular failure. I resisted until Tuesday lunchtime, but frustrated and bored I ventured out to test my Achilles. After running the first mile gingerly, it felt OK so I stretched out a little. I proceeded to bomb around my standard 9 mile lunchtime loop in sub 7 minute miling. I had a bit of a reaction in the achilles on Wednesday, but decided to run again on Thursday – a short lunchtime jog of 5 miles and then I thought I would go down to the track and join in with the Striders Thursday night speed session. It was a bitterly cold night, always worse at Beckett Park track which sits atop a hill, exposed to the chilling winds. On such a night, it’s a pretty grim place to train. Sensibly, I got there early to do a long warm up jog around the campus roads. Soon after setting off, my achilles was feeling quite sore and I knew that it would be stupid to try to run a track speed session. I bumped into Hannah in the reception and she didn’t seem to take much persuading to sack off the track session. We headed off for an hour’s steady run around North Leeds, including a softy speed session of 3 times 1 km on one of my old street loops. I don’t think we were very quick, but it was fun. I’ve kept up the heel drops – doing at least a hundred every day; and the indoor rowing. The rowing is definitely getting easier. Previously, I found it purgatory to row for 5000m, but this week I have done that twice, plus a 10K session and it was almost enjoyable. Mercifully, I think all the heel lowering might be working. With no race to do this morning, I had a lie in and then headed out onto the hilly snowy trails and just went running for a couple of hours. I didn’t really have much of a plan as to where I would run, or how far I would go. Because of the underfoot conditions, I ran slowly – over 9 minutes per mile, with an average heart rate of just over 120 bpm. It was wonderful just to get out in crisp cold air and run for the sake of it with no plans nor pressure. My achilles felt better than it has for weeks. According to somebody on Radio 5 Live, tomorrow is the most depressing day of the year. I can’t say that it has been a great start to 2016 – injuries, crap at work, floods, terrorism, economic meltdown and the deaths of some truly great people. It was one of those moments when the World froze for a second when I heard about Bowie’s death on Monday. Bowie – the cultural genius of my generation and one of the greatest modern Englishmen. Thank you David, what a fantastic body of work you have left for humanity to gorge on. To help cheer myself up, I’ve booked tickets to go and see another of the greatest Englishmen –somebody who couldn’t be more different to David Bowie – Ray Mears. He is giving a talk at Leeds Grand Theatre on April 3rd. I am a huge admirer of Ray Mears, an incredibly brilliant and humble man. I’ve watched all his TV shows and I went to a similar talk he gave a few years ago. I was completely transfixed watching a fat man talking over a slide show for two hours. It was brilliant and enthralling listening to somebody with so much wisdom, yet so little ego. If anybody is free on April 3rd, then you really should get tickets, you won’t regret it. I’ve also entered another Ultra – this time the Race to the Stones in July. It’s a 100km race along the Ridgeway in the Chilterns. Hopefully, the weather will be good and I’ll still be fit form Comrades. Mentally, I am going to treat the slow start to 2016 as a training reset. I’ll try to build the mileage back steadily without too much focus on speed. I’ve got another month until my next road race – the Snake Lane 10, though there are some cross country races before then.